It wasn’t all that long ago that ‘The Companion Chronicles’ (tales of The Doctor’s adventures in space and time told by, and from the perspective of his companions) as a series, came to what I still consider to be a premature end. They were and still are an interesting and – more often than not – captivating set of stories that explored the Doctor’s actions through the eyes of his friends, which allowed the audience to see him as they did. So their return, in a slightly different format (released less frequently, but featuring a lot more content) was welcome news; and having now spent an afternoon or two in the company of Susan, Ian, Barbara, Vicky, Steven and The Doctor thanks to ‘The First Doctor: Volume One’, I’m delighted to be able to say that it’s business as usual for this much missed series. 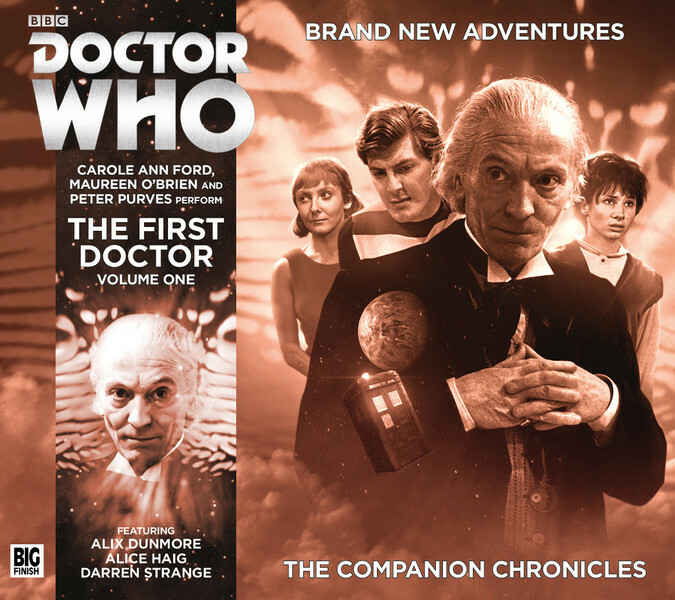 In fact, I don’t know if it’s because absence makes the heart grow fonder or if the break has allowed the writers and cast to recharge their batteries, but this collection seems far more focussed and in tune with the tone and spirit of the First Doctor’s adventures than the last couple, barring his final outing ‘The War to End All Wars’ which was rather good, did. Or maybe it’s just me imagining things. It has been known to happen. 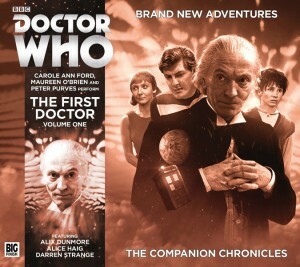 Anyway, on to ‘The First Doctor: Volume One’ and the three adventures (‘The Founding Fathers’ and ‘The Locked Room’ by Simon Guerrier are actually the first and second parts of the same story, or more accurately, the middle and final acts of tale that began with ‘The War to End All Wars’) that comprise it. Martin Day’s ‘The Sleeping Blood’ finds Susan searching for antibiotics for her grandfather on a colony world and stumbling into the middle of a terrorist hunt as a biological hacker threatens to rain death and destruction down on the people of the colony unless his terms are met, or he’s stopped by the squad of soldiers that Susan bumped into. It’s an intelligent, well written tale that questions the roles of opposing forces, soldiers and rebels, terrorists and freedom fighters and how they see themselves and each other the motivational factors that drive them, while postulating that nothing is ever as black and white as we’d like it be and that the truth always lies somewhere in the middle, hidden by, and in, shades of grey. ‘The Unwinding World’ see’s The Doctor, Vicki, Ian and Barbara stranded in a city where nothing seems quite right, and civilisation seems to be slowly unravelling despite the best efforts of its governing artificial intelligence and robots. As well as being an involving drama, Ian Potter’s offering explores the human condition, the flaws and qualities that make us who we are, and queries whether or not we, or anyone else, has the right to change what makes us “us” in order to try and “better” the species. And then it’s the turn of Mr Guerrier, who seems to be playing the long game (in that his tales of the First Doctor, past and present seem to be merging quite nicely, forming their own sort of canon-within-canon arc) his historical meets the far future drama that see’s The Doctor, Vicki and Steven (and Steven’s granddaughter) meet Benjamin Franklin while stuck in the past, and then having to finally deal with an enemy that they thought long dead. Both stories form an intelligent and engrossing finale to this first outing for the new look Companion Chronicles, and bode well for the authors, and Mr Purves, continuing involvement in this series.